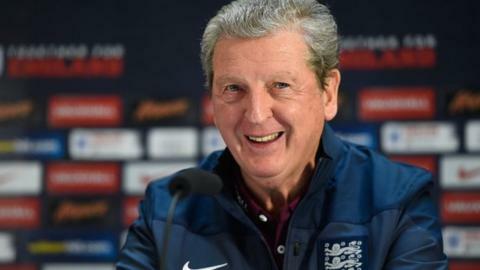 Roy Hodgson says England's striker options are "as strong as they have been" since he became England boss in 2012. Hodgson feels that Leicester's Jamie Vardy and Harry Kane of Spurs have been "a sensation" this season. The form of England and Manchester United captain Wayne Rooney is also encouraging to Hodgson. "We are pleased Wayne has pulled himself out of that trough," Hodgson told BBC's Match of the Day. Rooney went eight Premier League games without a goal, but has scored five times since the start of 2016 and Hodgson believes England's all-time leading goalscorer will have a key role to play in the summer. "He's an important player, our captain and a player we need to depend upon for the Euros," added Hodgson. Vardy, 29, is the Premier League's top scorer with 18 goals and his top-of-the-table side face third-placed Arsenal on Sunday. Kane, who has netted 15 league goals, will also be in action on Sunday as his Tottenham team in second play away at fellow title challengers Manchester City. "We have a lot of possibilities in terms of formation," said Hodgson. "We can play in a diamond, or with one centre forward, and the big thing is Kane and Vardy who have both been such a sensation." England begin their Euro 2016 Group B campaign against Russia on Saturday, 11 June before facing Wales on 16 June and Slovakia on 21 June. The option of playing Spurs' Dele Alli, 19, and Everton's Ross Barkley, 22, together in the same England midfield is one that Hodgson thinks could work. "The midfield is looking really good," added Hodgson. "We talked a lot about Ross and what he needs to add, if he can add a few more goals, and he is doing that now. "We have several formations, there no reason why Ross and Dele can't play in the same team because they are all-round players." The form of uncapped midfielders Danny Drinkwater, 25, of Leicester and West Ham 28-year-old Mark Noble has also been noticed by Hodgson. "It is good to see Mark Noble and Danny Drinkwater doing so well," said the 68-year-old. "We are pretty happy with our midfield, but it is nice to have extra competition. "We can never close the door. Mark is a very good character, as is Danny Drinkwater I believe." Hodgson also confirmed that he rang Southampton goalkeeper Fraser Forster during the 27-year-old's lengthy lay-off with a knee injury before he returned to action in January 2016. "Having him and Joe (Hart) and Jack (Butland) means we are as strong as England have been. "I tried to keep in touch with the players. Fraser is a very good character. Joe is playing well, Jack is paying well. "Jack wasn't playing, Fraser was injured and Ben Foster was injured, but now they are back again, which is excellent."